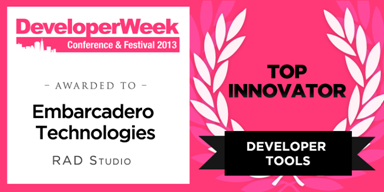 SAN FRANCISCO – Jan. 24, 2013 – Embarcadero Technologies, a leading provider of software solutions for application and database development, today announced Embarcadero RAD Studio has been named Top Innovator in the Developer Tools category for DeveloperWeek’s Best of Tech Awards. RAD Studio was selected as the winner through a combination of peer voting and review from an independent panel of judges. Award winners were announced in advance of DeveloperWeek, a developer conference and incubator event in San Francisco, which will be held Feb. 2-7. The DeveloperWeek award win comes on the heels of the release of Embarcadero C++Builder® XE3, a new C++ development platform for multi-device development, included in the RAD Studio product suite. C++Builder XE3 implements a completely new multi-targeting native compiler architecture that extends Embarcadero’s long C++ lineage for developers, ISVs, and enterprises who need to build high-performance applications for multiple devices. The new release supports natively targeting Windows 8 and Mac OS X PCs, laptops, and Intel-based mobile devices from a single C++ codebase and development effort.